Healthy Banana Oatmeal Cookies for a healthy dessert or enjoy them for breakfast! These banana cookies are vegan, dairy free, gluten free, and nut free. These cookies are chewy and delicious! Oatmeal makes for a heart-healthy breakfast, but some can’t handle the texture of hot oatmeal so making oatmeal cookies or even oatmeal bars is a great way to enjoy a healthy serving of oats. 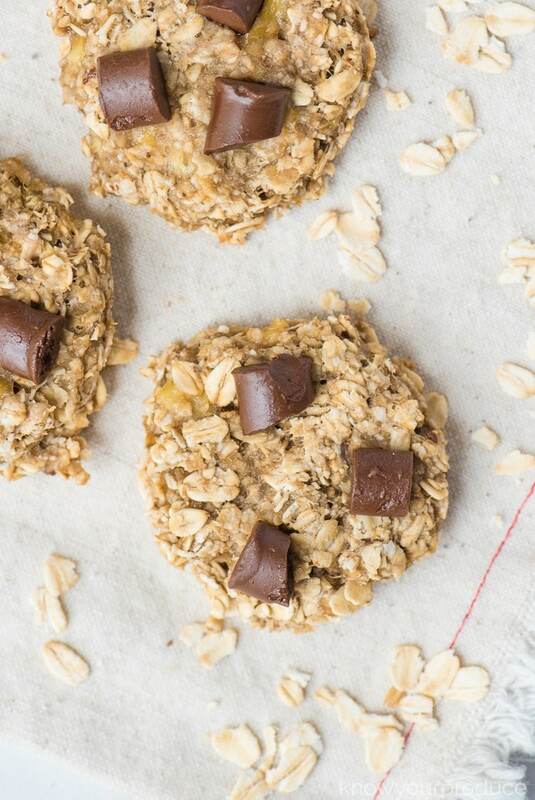 Who wouldn’t love banana oatmeal chocolate chip cookies for breakfast?? 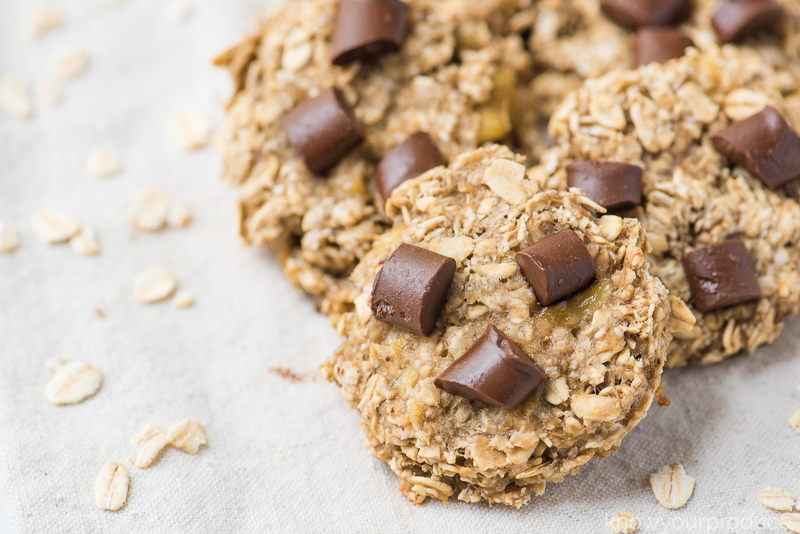 WHAT MAKES BANANA OATMEAL CHOCOLATE CHIP COOKIES HEALTHY? These cookies have no added sugar, no added flours, not even gluten-free. And yes these are vegan banana oatmeal cookies as there is no eggs or dairy products either. 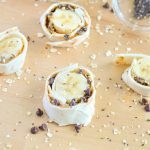 The base is only 2 ingredients, bananas and oatmeal and then the flavorings, toppings, and any add-on options are pretty endless! 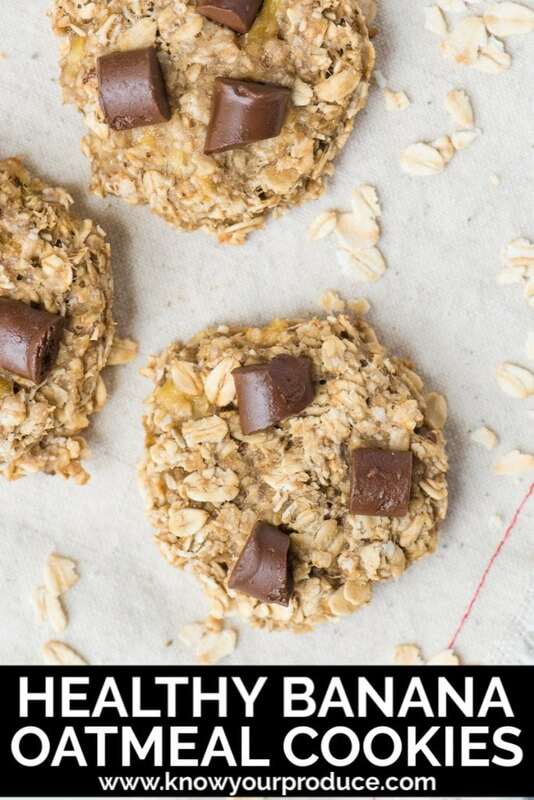 Our cookies are 3 ingredient banana oatmeal cookies as we’ve added some vegan chocolate chunks. WHAT KIND OF OATS DO I USE FOR BANANA OATMEAL COOKIES? You need to start with a combination of oats. 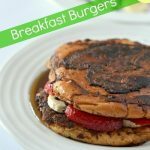 We recommend using rolled oats as well as quick oats. 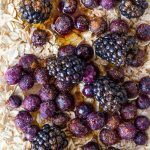 The rolled oats will get nice and chewy, keeping their texture, while the quick oats will cook down a bit and become nice and soft. It creates the perfect combination. 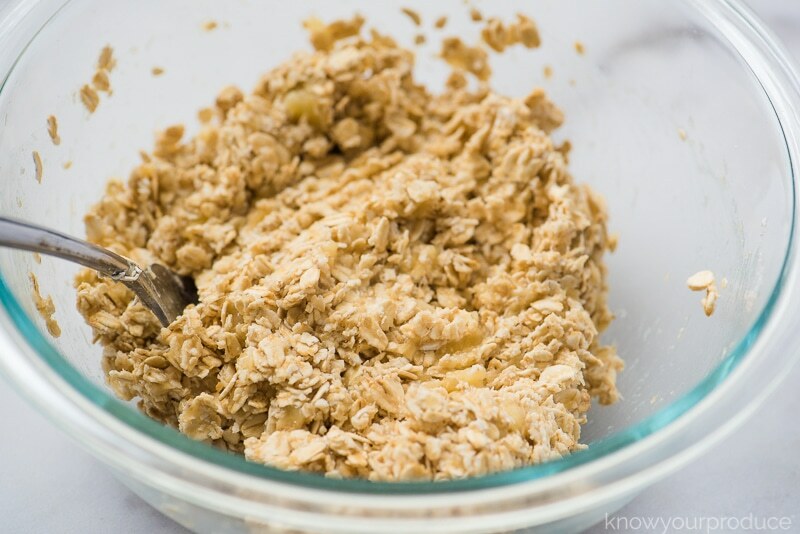 In a bowl combine the rolled oats and quick oats. In a separate bowl mash the overripe bananas until it becomes soft and liquidy. 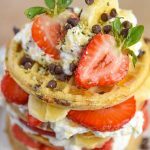 Combine dry ingredients with the mashed banana. Scoop the cookie mixture with a small cookie scoop and place onto a lined baking sheet. Flatten the cookies and top with chocolate chunks. Bake for 12 minutes and allow to cool on a wire rack before eating. 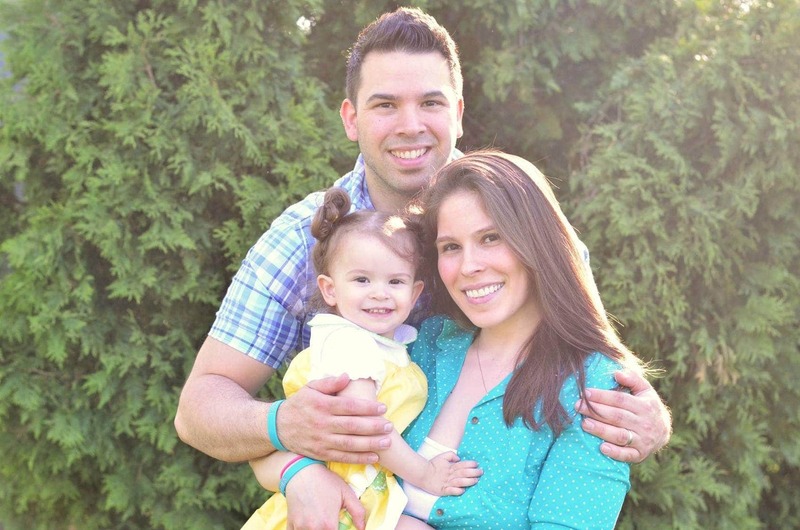 Here are a few add-ins that make these cookies even more delicious! Try them all different ways for a healthy treat option. Add berries, like blueberries, strawberries, or even raspberries. Add raisins – be careful as raisins (and other dried fruit) can have a lot of added sugars. Add chopped nuts, like walnuts or even peanuts. 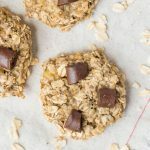 Add a scoop of peanut butter to make these peanut butter banana oatmeal cookies – can’t have peanuts? add your favorite alternatives like sesame seed butter, almond butter, or cashew butter. The resistant starch changes to simple sugar as the banana ripens. This makes it easier to digest. Plus they’re loaded with more antioxidants the more they ripen. In short, they’re full of sweetness and perfect for baking without adding any sugars. 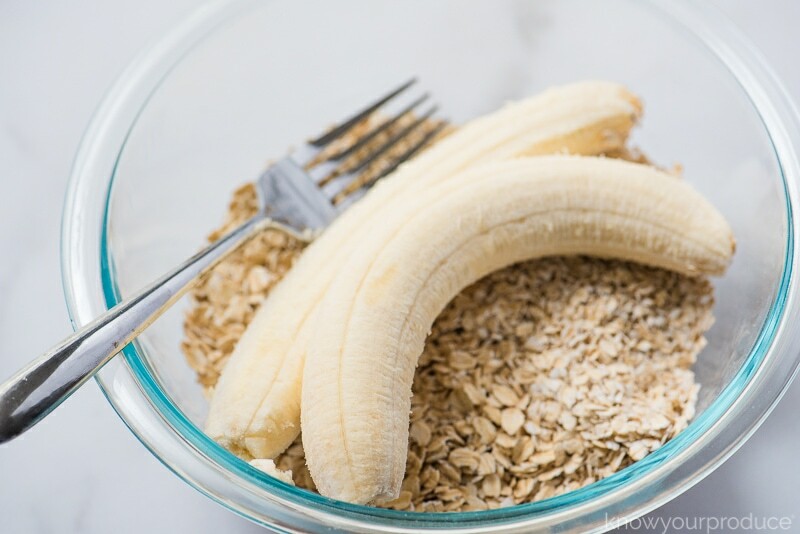 If you suffer from IBD (irritable bowel disease) Bananas and Oats (especially steel cut as they’re less processed) should be your best friend. 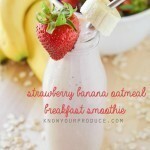 Our Banana Smoothie made with Kefir is an excellent gut-friendly smoothie. To make sure these are gluten-free cookies use gluten-free oats. 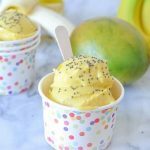 Use ripe bananas – they’re much sweeter! The bananas should be spotted and a little brown. Don’t overbake the cookies, they can dry out – we want the moisture to stay in them. 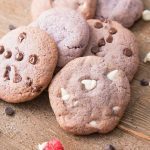 Add chocolate to the top of the cookies – by adding it to the top you make sure each bite has a bit of chocolate and they look pretty too! If you want the cookies more chewy and gooey you can use larger bananas. We use vegan chocolate chunks and recommend Enjoy Life Foods. Pour the oats into a medium-sized bowl. In a separate bowl mash the bananas until it becomes soft and liquidy. 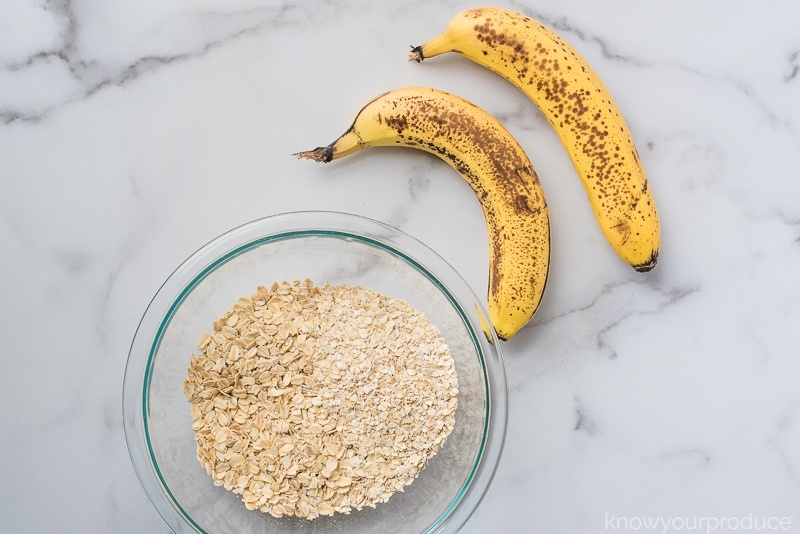 Mix the oats and bananas together until combined. Flatten the cookies before baking and top with chocolate chunks. Bake for 12 minutes and allow to cool before eating. 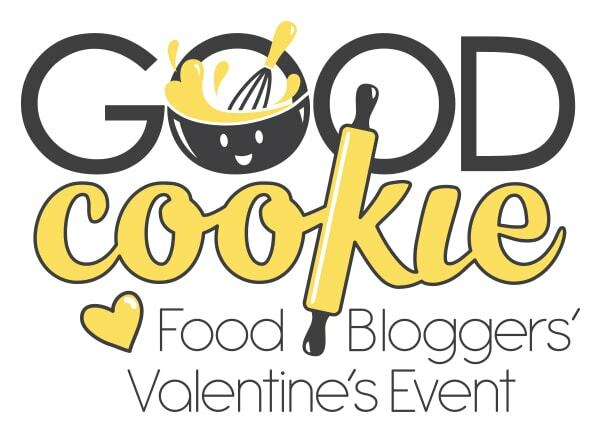 See all the cookie recipes over at The Little Kitchen! I love that my kids can make these by themselves. Until now they’ve just used boxed mixes. These are so much better! 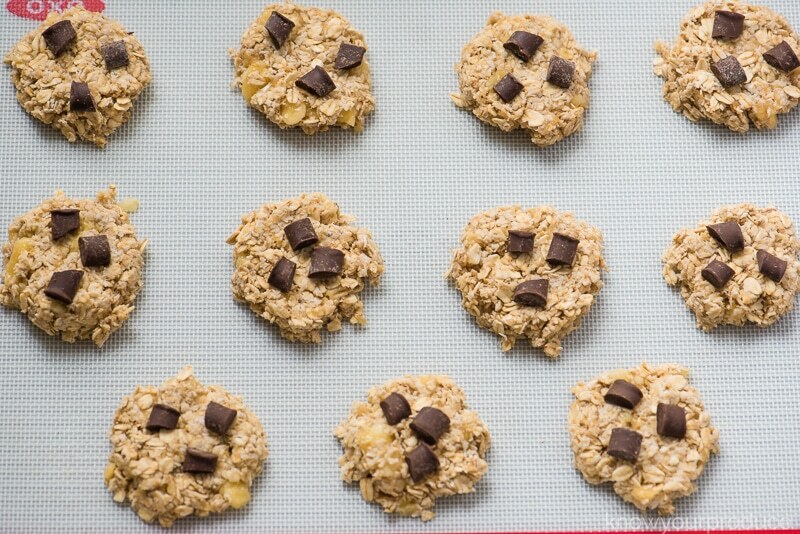 I love banana cookies SO SO much, and these are so easy to make! I always buy extra bananas just so I have an excuse to make breads and cookies. 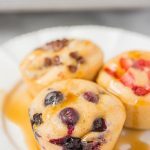 I like to add chocolate chips or frozen berries to mine for a little extra sweetness, but these are a winner by themselves!